Terry McPhillips says his Blackpool team are desperate to repay the fans’ faith and give them a win to celebrate at Bloomfield Road. Saturday’s 2-2 result against Plymouth Argyle means the Seasiders have drawn all three home games since the supporters returned from their boycott. Blackpool have won just once at home since early December – the 2-0 victory over Walsall in February – and McPhillips has revealed the players are anxious to put that right. “Fair play to the players for coming back to get a point,” the Pool boss said. “It’s a long, hard season after all. “We’re on a sticky patch at home. In the previous two home games I thought we were good, but that wasn’t the case on Saturday. We didn’t reach the standard we set in the 4-1 win at Bradford City (the previous Saturday), but when we’re 2-0 down with seven minutes to go, to get 2-2 is fantastic. 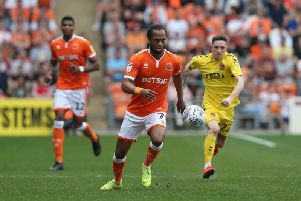 Blackpool were well below-par on Saturday but snatched a point after Marc Bola reduced the deficit with a volley and Curtis Tilt sent Bloomfield Road into raptures with an overhead kick in stoppage-time. Explaining Pool’s disappointing display, McPhillips said: “They played the pitch better than us, it’s as simple as that. “We know this pitch, so they can’t be better than us but they were and that’s football. “They took care of the ball better than us. It’s not easy out there but I’m not blaming the pitch – we just weren’t good enough. “But with our character and spirit we managed to get a draw. “I don’t think it was for a want of trying but the decision-making was well below-par. They made better decisions than us and kept it better than us. “We forced it a little bit. We passed it when we should have run with it or we ran with it when we should have passed it. Blackpool’s late revival came after McPhillips changed the system, throwing Chris Long up front to partner Armand Gnanduillet. “You’ve got to do something, haven’t you?” the manager added. “You can’t just sit and take it. “It didn’t look as though it was going to happen for us, so we changed it a little bit and did something different. “Marc Bola pops up with his goal, and the ground becomes electric again and inspires everyone to keep going.